Based on population estimates for 2016, The United States Environmental Protection Agency (USEPA) projects that more than 18,000 wastewater treatment facilities will be needed to process over 32 billion gallons of waste per day. Maintaining these facilities represent a huge challenge for operators in order to keep them running smoothly and continuously. At the heart of a consistent and reliable operation of these facilities is the pump. The pumps utilized in this industry are usually vertical such as, vertical turbine pumps, irrigation pumps, barrel pumps, fire pumps, or propeller pumps. These vertical pumps use a torsional, disc or gear coupling to stay in operation. Vertical pumps typically are for medium head applications where the specific speed of the pump ranges from 4000 to 9000. In a vertical pump, the pump impeller "sits" in a casing or bowl. The outer diameter contours of the impeller vanes match those of the bowl so that the tips of the impeller vanes are always parallel to the surface of the bowl. The parallel gap between the impeller vanes and the bowl, that is, the clearance, significantly influences the efficiency of the pump. If the clearance is too large, water can re-circulate from the high-pressure portion downstream of the impeller (above the impeller) to the low-pressure portion upstream of the impeller (below the impeller). This not only causes a loss in efficiency of the pump, but it can also lead to accelerated erosion of the bowl. On the other hand, if the clearance is too close, the surface hydraulic boundary layers of the impeller and bowl may interfere with each other. This causes the hydraulic friction due to viscous shear between the two boundary layers to increase, which decreases pump efficiency. Furthermore, if the clearance is much too close, the impeller and bowl may directly interfere and scrape on each other. This causes a significant decrease in pump efficiency. 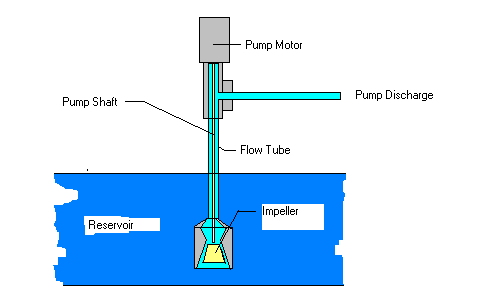 Energy intended for pumping water is diverted and consumed by the impeller grinding itself into the pump bowl. This contact causes permanent damage to both the impeller and bowl and shortens the service life of the pump. Between the two extremes of too tight and too loose, there is a "just right" clearance dimension. This "just right" clearance dimension allows the boundary layers of the pump impeller and bowl to slide over each other with minimal shear, but is not so large as to allow excessive re-circulation between the upstream and downstream sides of the impeller. At the "just right" clearance, pump efficiency will be at maximum. The manufacturer usually specifies impeller clearances. All pumps will need adjustment during the course of operation to maintain the clearance dimension that ensures maximum pump efficiency. Any adjustment is accomplished by actually lifting the impeller upwards such that its measured vertical gap between the impeller and bowl is within the range of acceptable values provided by the manufacturer or by the engineer in charge. Since the pump impeller and bowl themselves are normally immersed in water and are inaccessible, this is done at the top of the pump by loosening the pump shaft from the motor shaft at their coupling and allowing the impeller and shaft to rest on the bowl. This is the "zero" clearance position. The shaft is then lifted upwards, usually by tightening coupling bolts or adjustment plates, from the zero clearance position. The amount of lift is the amount of upward displacement of the shaft and impeller created by tightening the coupling bolts or adjustment plates from the zero position. The clearance measurement is usually made with feeler gages or dial indicators. At the component level, this is where the right style of coupling can save the operator valuable time and energy, by offering the right combination of design, consistency and reliability. Very few manufacturers, such as Lovejoy Inc., provide Rigid Adjustable Type Couplings (like HercuFlex™). These couplings allow easy axial adjustment of impeller clearance in vertical pump installations designed for stationary applications, such as sewage digesters and lift stations, manure tanks, chemical sumps, and dry docks. In conclusion, couplings from other manufacturers are encapsulated, and must be removed entirely from the pump in order to provide routine maintenance. In contrast, the design of the HercuFlex™ rigid adjustable coupling inherently fits better into a vertical pump application. All of the adjusting nuts and bolts are readily available and exposed, to help the operator replace components without taking apart the machinery – making routine maintenance a breeze when compare to other couplings. For your reference, the coupling utilized in this application is the new generation of gear couplings from Lovejoy, HercuFlex™. This revolutionized coupling offers increased nominal torque, larger maximum bore size and longer service life. Despite the advanced nature of these improvements, this Gear Coupling still utilizes the standard AGMA flange interface to ensure field interchangeability. Its RA/RAHS Series offers both close-coupled, Type II, and spacer styles, Type IV, in standard (RA) type and high-speed (RAHS) type, which is specially balanced to API 610 8th edition tolerances. About the Author: Kevin Remack, Vice President of Sales for Lovejoy Inc., has many years of experience in the mechanical power transmission industry and has been a longtime supporter and champion of Lovejoy coupling solutions.